British cycle clothing brand Rapha has rolled out a wider range of products for its new Spring/Summer collection. For 2015 The Pro-Team line will also be available in a new pattern, which the London based brand is calling ‘Data Print’. 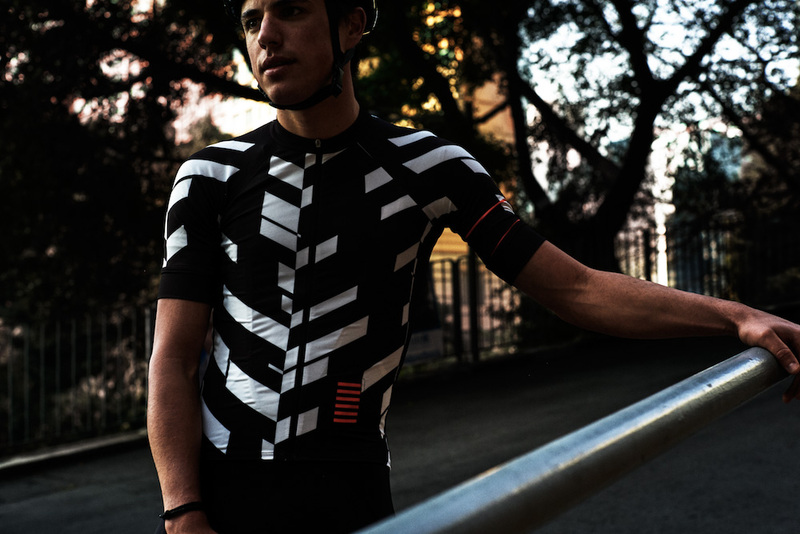 This unusual monochromatic print is inspired from a graphical representation of an individual racer’s entire Tour de France ride data. By working in collaboration with the design studio Accept and Proceed, Rapha is aiming to combine science and graphic design. By charting the rider’s performance on each stage, the print is made from precisely scaled chevrons, the area and length of which relate to the distance, elevation and training stress score of that specific stage. 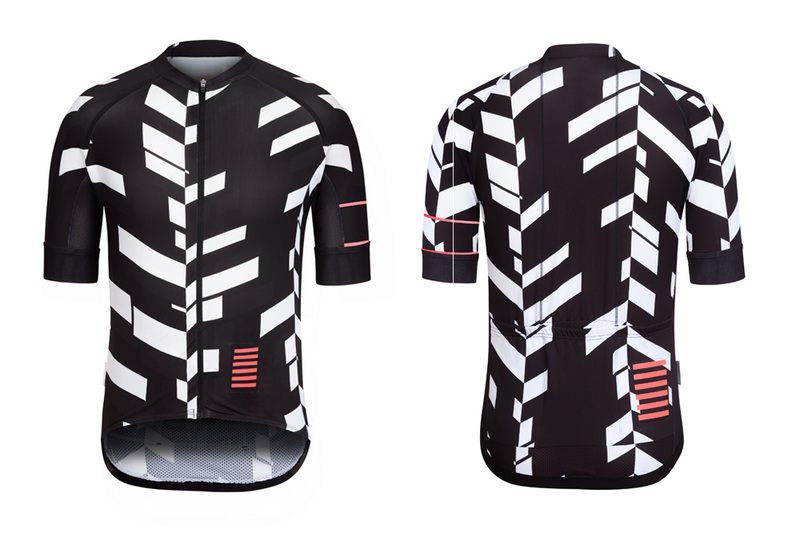 The Data Print Jersey, pictured above, will retail at £120. 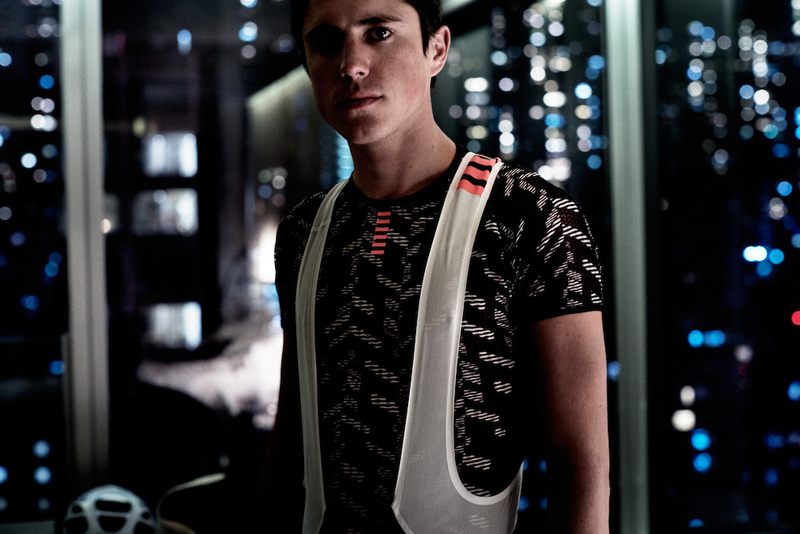 The Pro Team range is intrinsically linked to Rapha’s links with Team Sky, with 2014 British National Road Race champion Peter Kennaugh being the face of the collection for 2015. The Manxman said: “Cycling to me is not just about the numbers and winning races, it’s about the style. The sense of freedom when you are off the front, when you are driving the peloton and knowing you are putting others in pain, putting it all on the line in the little hope that you might pull off something legendary. 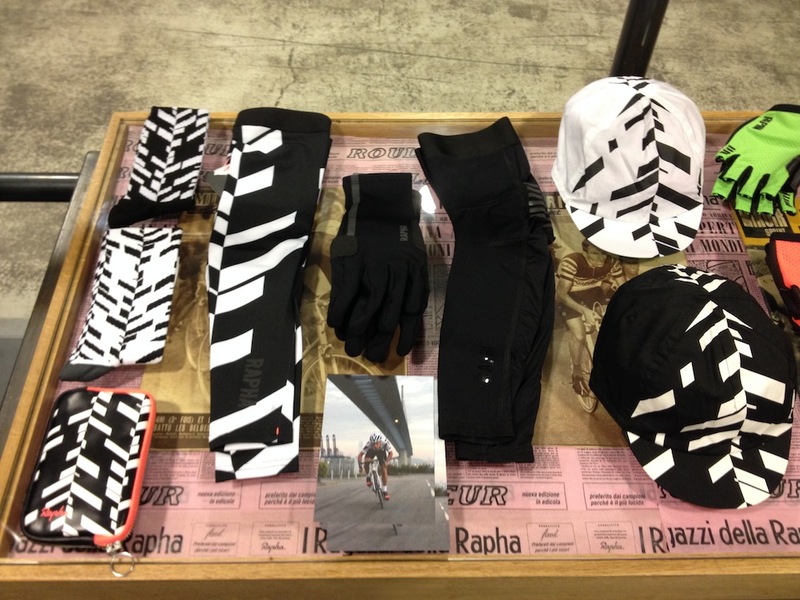 The print is also available in matching accessories, including caps, socks, arm warmers and base layers, seen here (below) at Rapha’s launch. Although it may divide opinion, with some perhaps touting it as ‘digital zebra’, it makes a refreshing change from the block colours and simple designs we have grown used to. It does however still feature Rapha’s signature horizontal block stripes in the bottom right corner. For those unaware, the stripes are an abstract representation to prison bars and are a nod to journalist Albert Londres’ description of the 1924 Tour de France peloton as the ‘convicts of the road’. For more information and a video of the new graphics, head over to Rapha.